Western Springs Go to page two. For more history of Western Springs visit their supporters club site. Here is an account of those early days taken from a 1952 Waiwakaiho program. Where and when did midget car racing begin? When did it start in new Zealand'? These are some of the numerous questions and queries we receive from midget speedway enthusiasts at Waiwakaiho. By kind permission of the late Andy Alcock of Auckland, we are able to answer these and many other questions from the manuscript of the first New Zealand "Midget Racing Annual" to be published by author Andy some time in 1952. It is always hard to establish for a certain fact where a particular sport first began, but the widely accepted version is that in 1932 an A. Williams, Fresno, California, built a motorized midget for his child. Other fathers caught on to the idea for their children and during week-ends the fathers took over the cars and held impromptu meetings. Some of the owners "souped-up" their motors and eventually the cars grew up into what became the standard midget class. From Andy's "Midget Racing Annual" we find that New Zealand interest began in 1935 when George Smith (Auckland) built "The Tom Thumb" powered with a Harley Davidson motor-cycle motor, while "The Auto-Parts special" powered by an Elto outboard motor was built by Jerry Mathieson (Auckland). Several others were built, including Merv Hardy and Reg Dicken's car powered by a Henderson 4 motor. cycle type wheels appeared as early as 1915 and also raced on dirt tracks, and a trophy race in 1915 attracted at least 7 starters. Then midgets as we know them now appeared around 1932/33 as mentioned above. Web masters note 2. More recent research shows that in New Zealand in 1935, two teenagers, Ron Roycroft and Harry Charteris, built a "midget" with an Austin 7 engine and wheel barrow wheels. It was built from Popular Mechanics plans but never raced. However it was part of the inspiration for Ron's father A.J. Roycroft who had seen motor cycle racing at Western Springs at the time, and then organized a team of cars and drivers from USA to visit in 1937. Also note that a race with two "midgets" was held at Kilbirnie speedway in February 1935. Photo at left is a 1946/47 season shot of "broadsiding" and caption stated 20,000 spectators were there!. It was one of only three NZ speedways operating at that time and ran midgets and solo bikes. It was normal then to run six bikes in each race. Although some of the cars were on show at Western Springs Stadium, when the track was officially opened to motor-cycle “broadsiding” in December, 1935, it was not until Christmas Day, 1937 that midget car racing made its debut at Western Springs. A team of five Americans, Duane Carter (99): Paul Swedberg (18): Beale Simmons (27). Swede Lindskog (14) and Vince Podurgiel (8), with Australian Arch Tuckett and his original Australian midget, number 9, which he built and raced to win the Queensland and Victoria State championships, and George Beavis another Aussie with championship honours, driving his Brough Superior motored midget, number 4. At this meeting Jerry Mathieson became the first New Zealander to officially complete a race and held his own for a first and second. George Smith the only other New Zealander at the meeting had engine trouble with his super-charged Austin 7 and unluckily could not take part. The fastest time for one lap of 21 seconds, was set by P. Swedberg, U.S.A..
On January 1st, 1938, the second New Zealand midget car racing meeting was held at Western Springs stadium. Arthur Dexter with the Dexter Riley Special, No. 2, and Ron Roycroft, with his Plymouth Special, No. 88, made their appearance at this meeting. George Smith, driving the Dexter Riley in the main event, was involved, during the fourth lap, in a head-on crash with George Beavis, the Australian, in his Brough Superior, No. 4. The Riley, which had just been completed in time for the meeting, was extensively damaged, as was No. 4, but the drivers came out unscathed. Sel Casey, a well known motor cyclist of the time, appeared in No. 31, which was a rebuilt model of George Smith's "Tom Thumb." The following week at the third meeting, Dexter and Roycroft both had lucky escapes when their cars caught fire during races. The visiting Americans mentioned in the first part of this story, took most of the places at this meeting, with their superior equipment and wider experience. Nevertheless, the midget racing interest had been well aroused in New Zealand, for two more local boys, L. Driver, No. 11, and W. Register, No. 1, made their first appearance, together with another Australian L. Pratt, No. 6. Public following grew with each meeting and on the following week the crowd was there to acclaim A. Dexter when he beat the American, V. Pordurgeil, in a heat. Bob Pearson, 77, of Australia, appeared at this meeting but was disqualified for using the concrete banking. 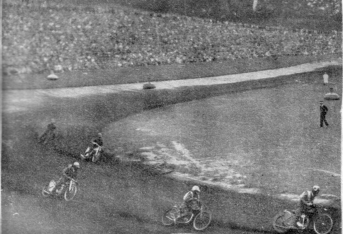 For the benefit of those who have not seen midget racing at Western Springs, the loose tanned surfaced racing track is encircled by a concrete banking which midget racing rules at the Stadium states is not to be used to advantage while racing. It may be used without penalty to avoid an accident. Local drivers were securing a substantial number of the placings with each new meeting. Later in the season, M. Danks was seen driving 31, which was taken over by Sel Casey and raced as 77. Car 72; which had been imported by the Americans as an extra in case of accidents, was handled by New Zealander Jack Stewart. At the eighth meeting, on February 19th, 1938, Stewart received a great ovation from the crowd when he won the final of the Segetin Trophy Handicap with another New Zealander, Gerry Mathieson, in second place. The ninth meeting brought the season to a close with the appearance of yet another new local driver. Tim Bill raced No. 56, which turned out to be the former 77 equipped with an old racing HarIey Davidson motor cycle engine. This car had been unsuccessful until raced by Tim with a slight adjustment in the fitting of a new carburettor. At this meeting Duane Carter, 99, set a four-lap record of lmin. 23 4-5sec., which coincidentally, was beaten by 3-5sec, by our local 99, with Roy Low behind the wheel, last meeting, (at the Waiwakaiho circuit). This created a new track record of 1min. 23 1-5sec. 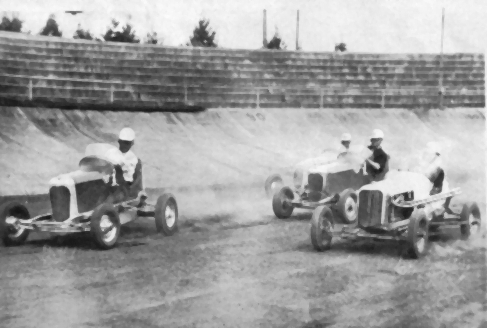 The second season of midget racing at Western Springs Stadium, Auckland, opened on December 24, 1938, but prior to this a meeting had been held on the Auckland showground's at Epsom over a flagged course. Previous season's drivers, A. Dexter, G. Mathieson, M. Danks, R. Roycroft, L. Driver with a new No. 15, and Jack Stuart with a new car, 77, appeared at the Stadium on the opening of this season, together with newcomers Fred Mayer 1; Bill Forder and Charles Segetin driving 5; Jim Carter 6, with wheels and body of Arch Tuckett's 9 of the previous season incorporated; Max Hughes with George Smith's special, No. 44, and Frank "Satan" Brewer, 72, making the beginning of what was to be a world famous career as a midget racing driver. "Roscoe" Turner, 4, and Swede Lindskog, 3, returned from America, with Roy Ritcher making his first appearance in New Zealand with V8-60 powered No. 2. Arch Tuckett sailed over from Australia with Duane Carter's old 99 renumbered 9, accompanied by Arthur Wylie, 8, and Ken Wylie, 10. The meetings were of a very high standard right from the start of the season, the placings being shared by all. During the fourth meeting on January 7, 1939, Frank Brewer hit the fence at the top of the con­crete banking but was later able to appear in, and win, the feature race. The fifth meeting saw 10,000 spectators witness Englishman, Bill Reynolds, cover one lap in 19 4-5sec. with his record-breaking four wheel drive "Skirro" midget 78, built in England. Roy Ritcher was timed at 20 4-5sec. for one lap with his rear wheel drive V8-60. These times had bettered those of Paul Swedberg, acclaimed New Zealand midget racing cham­pion of the previous season, and stood until quite recently when bettered by Lex Wilson at Palmerston North. At the sixth meeting Reynolds gained two wins to Lindskog's one in Anglo-American match races. Below is 1938 line up. On practice night prior to the following meeting on February 4, Roscoe Turner met with a serious accident while taking a trial run in Roy Ritcher's V8-60. The car hit the safety fence, threw the driver clear, seriously injured, and careered on to turn over and finish several yards outside the fence. Ken Wylie created thrills and chills at the meeting on the following night when his car overturned. Luckily Ken es­caped lightly. At this meeting Lindskog created a one-mile four-lap record of 1.23 1-5sec. while Reynolds, with his four-wheel drive "Skirrow" bettered this by one second. This action shot on left during the second season at the 'springs clearly shows the concrete cycle track outside the cinder track. Shown left to right are Arthur Wylie (also above) leading Roy Richter, Ken Wylie and Swede Lindskog (USA). The eighth meeting brought the second season to a successful close at Western Springs. Max Hughes received the cup for season's points in the Butcher Cup Handicap, while Swede Lindskog gained the Urquhart Cup for season's points in the feature race. During the second season of Midget Car Racing in New Zealand, four meetings were held on the Kilburnie Speedway, Wellington, with home and overseas drivers appearing. Considerable interest was aroused with the first appearance of these cars in the capital city and a meeting was held to form a local speedway committee. Len Southwood, owner of the famed speedboat Red Head, was an interested attendant. Several cars were later built but with the intervention of war nothing further could be done as the speedway was taken over by the military authorities. The season finished, overseas drivers bade farewell and returned to their homeland. Before leaving Roy Ritcher sold his midget, No. 2, to Bill Forder, minus the motor. Bill renumbered it 4 and in­stalled a Terraplane 6 motor for the following season. Jack Fitzgerald, of Australia, bought the American, Lindskog's No. 3. Frank "Satan" Brewer journeyed to the U.S.A. during the off-season and returned with a new V8-60, bearing his famous No. 99, ready for the 1939-40 racing season. Several new cars and drivers appeared through this season; Hughie McKenzie, 12; Malcolm Kirker, with a special Riley motored 14; Norm Maddaford, 22; and Ces Driver, with a special of his own design, powered by a Willys motor, and bearing No. 15. Frank Keefe built a new Ford A motored midget, 55; Stan Owens drove Jack Stewart's 77, and Ivan Brewer drove brother Frank's 72 of the previous season. Ken Wylie, Arch Tuckett and Jack Fitzgerald all put in an appearance from Australia. The veteran drivers of the two previous seasons were out again in . full force. Keen competitions resulted, with the more outstanding drivers being Frank "Satan" Brewer, Gerry Mathieson, Max Hughes and Ron Roycroft. At the sixth meeting of the season in early February, 1940, spectacular thrills were aplenty. Ron Roycroft and Frank Brewer raised gasps from the crowd when they went across the finishing line, cars locked together, then to part company and swerve hair-raisingly in opposite directions. Expert driving avoided a serious accident. Later in the meeting Frank's motor blew up, leaving him out of the rest of the racing that night. During the feature race, brother Ivan helped with the thrills when involved in a crash with Norm Maddaford. Both cars were extensively damaged but neither driver was hurt. An unusual and unfortunate accident occurred when Roycroft spun up on the grass and knocked down a bystander who suffered serious leg injuries. On the night of the eighth meeting a 15-lap New Zealand Centennial Championship highlighted the program. Frank Brewer took the trophy and sash with Ron Roycroft second and Max Hughes third, covering the 15 laps in 5min. 31 4-5sec. At the next meeting S. Owens took the New Zealand Junior Championship, run over six laps, from J. Fitzgerald and H. McKenzie, the time being 2min. 20 4-5sec. The final meeting of the season on March 23rd, helped the patriotic funds provide sports equipment for local military camps. Prior to the start of the fourth season at Western Springs Stadium on December 28, 1940, Arch Tuckett's midget was sold to "Pee-Wee" Anderson while Arch answered the call to duty and joined the R.N.Z.A.F. Still further new cars and drivers made their appearances. Snow Ruffles produced his V8-60 powered, lo­cally made No. 25, while Ron Sutherland produced 31, incorporating parts of the original 31 and equipped with a Chevrolet 4 motor. Morris Hodgson drove Wally Powell's International Special No. 11, previously driven by Fred Mayer, and Ted Sutherland piloted No. 44, which he purchased from George Smith, who had Max Hughes for his driver during the previous season. Ted and Bill Boyd produced Chevrolet 4 powered No. 9, while later in the season Marty Sutherland formed a driving trio with brothers Ted and Ron. After a second successful season's racing in the U.S.A., Frank Brewer returned to New Zealand to give some outstanding exhibitions of driving and racing skill. At the third meeting he created a new four-lap re­cord of one minute 23 seconds. A three-car crash near the pit gates during the feature race brought fans to their toes, so with plenty of thrills and lack of injuries the meeting proved most entertaining. During the first race of the following meeting Snow Ruffles capsized his V8-60 and suffered injuries to an arm but after treatment at the hospital he was able to return to the speedway to receive an ovation from the spectators. At this stage of the season Frank Brewer was notably absent from several meetings, as he was having some difficulty righting engine trouble his car had developed. Appearing at the sixth meeting on February 15th, George Beavis was welcomed back to New Zealand by a crowd estimated at over 7000. George raced a new Offenhauser midget, No. 18, which he had secured in the U.S.A. the previous year. Two trial match-races between G.Mathieson and G. Beavis were on the pro­gram, each gaining a win in the identical time of one minute 2 3-5 seconds for three laps. The boy from Australia created a new four-lap record of I min. 20sec in the eighth meeting which was equalled on the same evening by Frank Brewer. Throughout the rest of the season these two drivers produced some thrilling close-finishing match-races. It was at this meeting that Bill Forder left the track to crash into a light car, overturn and catch fire. Bill and one spectator was injured and taken to hospital for treatment. An intermediate championship far second-year drivers over eight laps resulted in a win for Ivan Brewer, driving brother Frank's 99, with J. Fitzgerald and S. Owens in the minor places. ; The time was 3min. 8 4-5sec. Before leaving for the U.S.A. George Beavis defeated Frank Brewer in a special match-race, but the high­light of this ninth meeting was the New Zealand Open Championship over 15 laps which Brewer won from Beavis and N. Maddaford in 5min. 17 2-5sec. An afternoon meeting on March 15th concluded the season with Frank Satan" Brewer receiving trophies for the outstanding driver of the season. Jack Malcolm in George Mathieson's Special No. 17, made his first ap­pearance with Fred Crowther in Ron Roycroft's 88. Malcolm had a most successful day, clinching three firsts and two seconds. Snow Ruffles took the Junior Championship from Malcolm and Hodgson in 2min. 17 2-5sec. for the six laps. With the intervention of war and restrictions on use of lighting this was it, the last Midget Racing meeting on Western Springs Stadium for several years. Many of the old stalwarts, including Fred Crowther (2), Jim Carter (6), Hughie McKenzie (12), Jack Malcolm (17), Ron Sutherland (31), and Ted Sutherland (44), appeared at the December, 1944, re-opening with Ted Boyd (22) and Max Hughes (72), raced pre-war by Ivan Brewer. Making their first appearance in the midget world were Roly Crowther driving Jack Fitzgerald's (3); "PeeWee" Anderson (9), which he had bought from Arch Tuckett, Stuart Armstrong (11), Ray Hardy (15), Laurie Powell (25), Bob Harvey, with Roycroft's 88 re-numbered 38, Max Butler (55), and "Snow" Morris (77). Fred Brennan appeared with (8), a Plymouth powered racer he built himself, while Des Herrick produced an unraced car, 66, built by Kelvin Lovelock, of Tauwhare. Merv, the third of the Sutherland boys, handled 75, which was originally 9 and then 71. Later in the season Jack Lough, present owner of 2 which was driven at Waiwakaiho last year by Roly Crowther, wheeled out 19. The most outstanding driver of the season was undoubtedly Roly Crowther who won the New Zealand junior championship for the season from R. Harvey and L. Powell over eight laps in 3min. 11 sec., and later collected the open championship from Ron Sutherland and Jack Malcolm over 10 laps in 3min. 57 2-5sec. Incidentally, the following season saw Roly create an unsurpassed record in New Zealand midget racing when he again took the open championship using the same car, No. 3. A spectacular crash occurred at the open championship meeting when Norm Maddaford collided with Jimmy Carter, the car overturning and bursting into flames. Luckily the extinguishers were quickly on the job and cars and drivers suffered little ill-effect of the crash. During the following meeting Bob Harvey's car lost a wheel which flew into the spectators, injuring one woman. Further thrills of the season were provided at the final meeting when Max Butler's car caught fire. Highest aggregate points for the season went to Jack Malcolm with Roly Crowther, winner of championship cups and points, second, and Ron Sutherland third. All-told the season had been more than successful after a lapse of several years, average crowds being estimated at 7000. Thanks to Andy Alcock, Auckland, author of 1952 "N.Z. Midget Racing Annual". 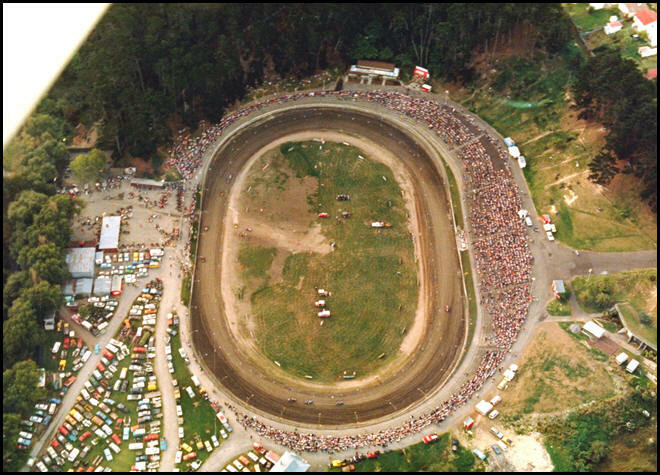 Below is an aerial view of the stadium, the day of the first 50 lap classic, at Western Springs. The photo was taken by Don Leitch from a Cessna. The gates opened early and queues to get in went up to the end of stadium road and around past Motat. Commentator Bill Mudgway asked all the spectators sitting on the terraces to please move 6 inches (150mm) to the right so more fans could sit down. A reported 35,000 people were in the stadium. Knowing the terraces can only hold 11,500, it’s probably a hyped up number, but who knows. At the time, it was the richest speedway race in the country. Return to Home Next page TOP. 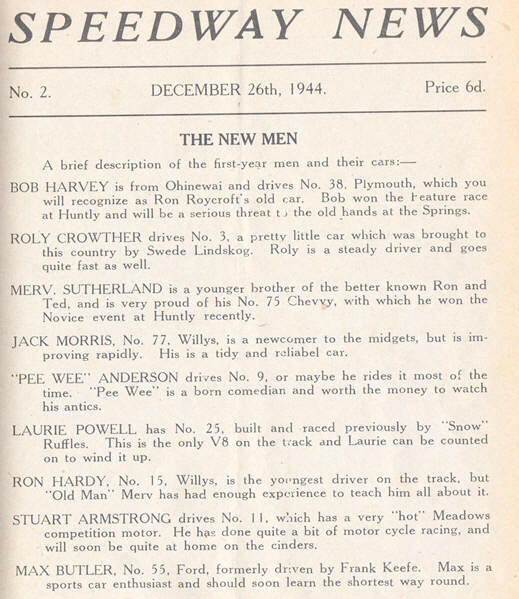 Note the write up in the boxing Night program (below) about the first year drivers in the 1944 season at Western Springs. Some names which would become famous in New Zealand midget racing. Roly Crowther went on to become a national title holder. Likewise, that driver, Jack Morris, who would become better known as ‘Snow’ Morris, Pee Wee Anderson, Laurie Powell and Stewie Armstrong who would go on to become fan favourites. Note the comment re Merv Sutherland at Huntly Speedway.